Search for “Chinese character tattoos gone wrong” in Google and you’ll find that Mike is far from the only non-Chinese-speaker to have made this error. People want tattoos that signify their appreciation of things exotic and, uh, mysterious, but if they don’t actually know the source material, true meanings can be lost in translation. 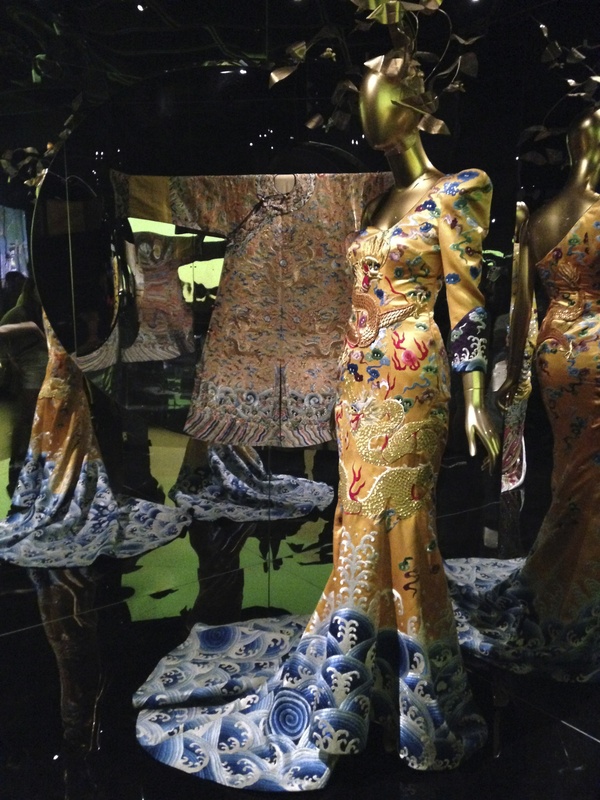 “Through the Looking Glass” examined how ideas of China have been taken on and translated by Western fashion designers, from 18th-century Chinoiserie through a high-fashion Mao suit featuring shorts and a lipstick-red patent-leather belt. Crucially, the exhibit’s organizers emphasized that they were not questioning or critiquing how “correct” these Western ideas of China are; their intent, it seems, was to demonstrate the fact that Westerners have long been fascinated by China and found in the country and its culture a source of inspiration. This is a tricky line to walk because it gets into questions of cultural understanding and appropriation, with the ghost of Edward Said looming over it all. Said, author of Orientalism, argued that Western depictions of “the East” (stretching from North Africa east to Japan, though Said’s focus was on the Middle East) were embedded in imperialism and inherently patronizing and feminizing. Complex societies and cultures were reduced to simplistic tropes that portrayed the East as inscrutable, dangerous, and alluring—but backward and in need of a firm Euro-American hand taking control. In other words, in an Orientalist perspective the entirety of Chinese culture, history, and society boiled down to: dragons, opium, foot-binding, concubines, the color red, the imperial system, and Confucianism. More or less. this exhibition attempts to propose a less politicized and more positivistic examination of Orientalism as a site of infinite and unbridled creativity. … it presents a rethinking of Orientalism as an appreciative cultural response by the West to its encounters with the East. So, Western designers might work in outdated and essentializing stereotypes, but … that’s because they really like those stereotypes? I’ll let the cultural theorists hash that one out. What did I think of the exhibit itself, once I stopped puzzling through the introductory text? Because here’s the problem when you’re putting stereotypes on display: everyone has seen them before. They’re stereotypes. 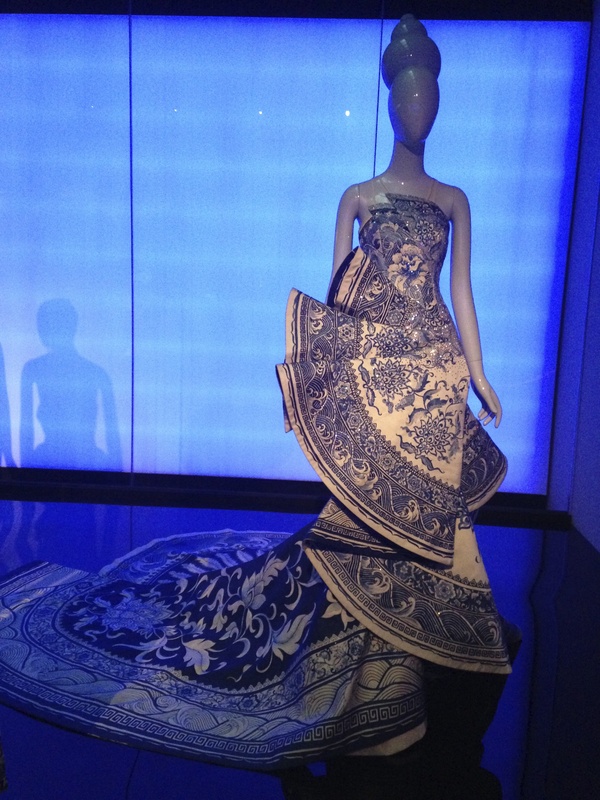 So prominent features of the exhibit were: qipaos (and variations on them), dragons, Mao, the colors red and yellow, “Lotus Flower/Dragon Lady” actress Anna May Wong, opium (the Yves Saint Laurent fragrance, that is), and blue-and-white china. Almost all of the dresses were beautiful, and I frequently wished that I’d come at a less crowded time that would have allowed me the leisure to examine them more carefully. I also wished for more time to stand still and watch the film clips playing at various points along the exhibit route. Curated by prominent director Wong Kar-wai, the clips added another layer of translation and exchange; most of the ones I caught were from movies made in the 1980s or later by Chinese directors (two exceptions being Cina (Zhongguo) and The Last Emperor, both directed by Italians). Those movies look back at a past that their directors didn’t necessarily experience and may regard with their own set of stereotypes and romanticization. So a Western designer searching for pre-1949 Shanghai in Lust, Caution or watching In the Heat of the Sun to learn what the Cultural Revolution was like is even further removed from the real thing. But what is “the real thing”? I suppose that’s the question “China: Through the Looking Glass” wanted me—and the other 815,991 visitors to the exhibit—to ask. How important is it for a designer to really understand another culture before he or she incorporates it into their work? Can we only work within the parameters of our own societies, histories, cultures? Is cultural appropriation always wrong? The exhibition designers, I think, tried to argue that the answer to that last question is “no.” I disagree. But more than anything else, seeing so many examples of the Western vision of China together in one place brought home to me how tired that vision is. We really need to move beyond qipaos, Mao, dragons, and calligraphy. Speaking of calligraphy: my former co-worker Mike, and all those other people with smile-inducing Chinese tattoos, shouldn’t feel foolish. Such mistakes can happen to anyone. 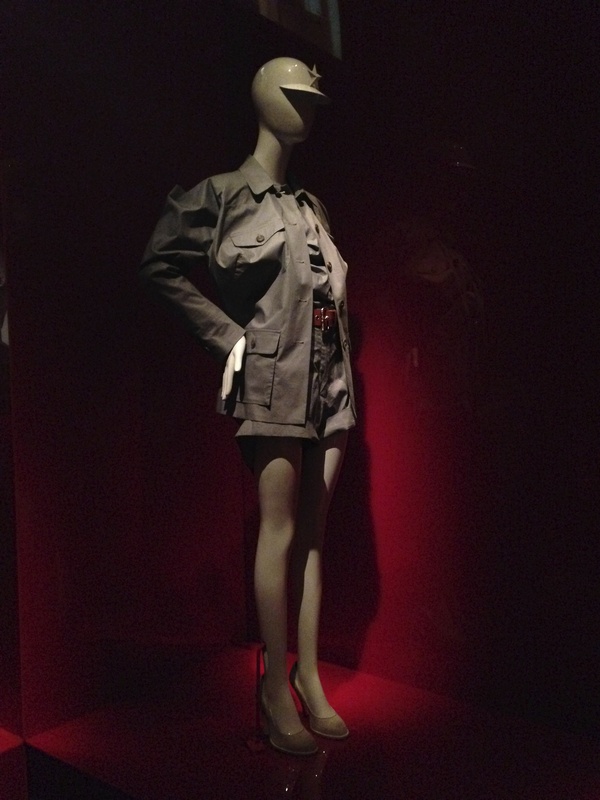 One of the simpler designs on display was a beautiful 1951 Dior cocktail dress, its cream-colored silk folds covered in fluid Chinese cursive. On reading the placard, however, I learned that the text printed on the dress was a famous 10th-century letter … describing the author’s sudden abdominal distress. Update, September 23, 2015: This post has been translated into Italian at Cinaforum. Many thanks to Alessandra Cappelletti for suggesting and facilitating this collaboration. When I first saw that his tattoo said 奇怪，I thought, Oh, dear. I’m not a Chinese language expert, but I know that term well and would use it when I wanted to say “strange” or “weird”. I was going to make a special trip to see this exhibit, but now I’m glad I didn’t bother. I have the catalogue and a scent stick of Nuit de Chine. 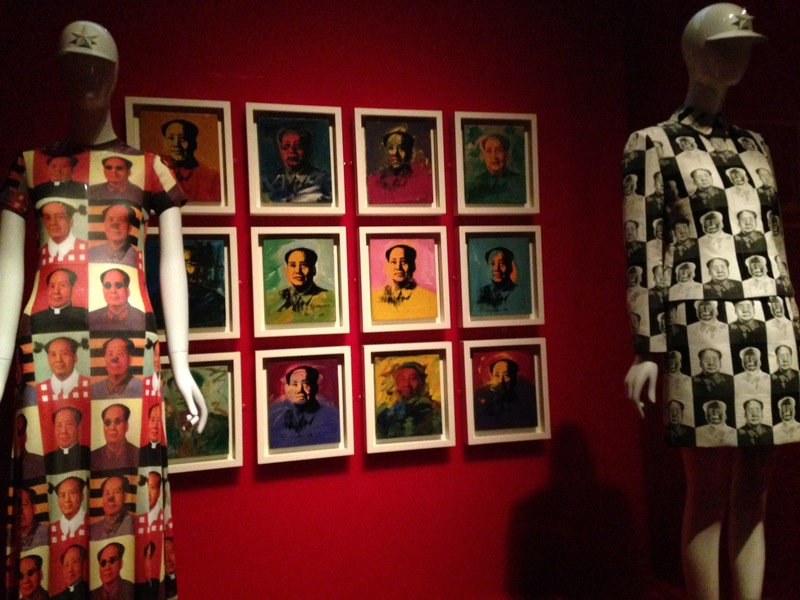 What irks me about the overuse of Mao in fashion and pop culture is that he was responsible for tens of millions of deaths. Stalin, Hitler and others aren’t use this way. I think it’s very disrespectful to people who suffered during the Mao years. How horrifying it must be to see him as a pop icon. I know there’s a cult around him in China, but that’s not the case outside the mainland. Love that last blue and cream dress!!!! Me, I got no problem with Chinese fashion….